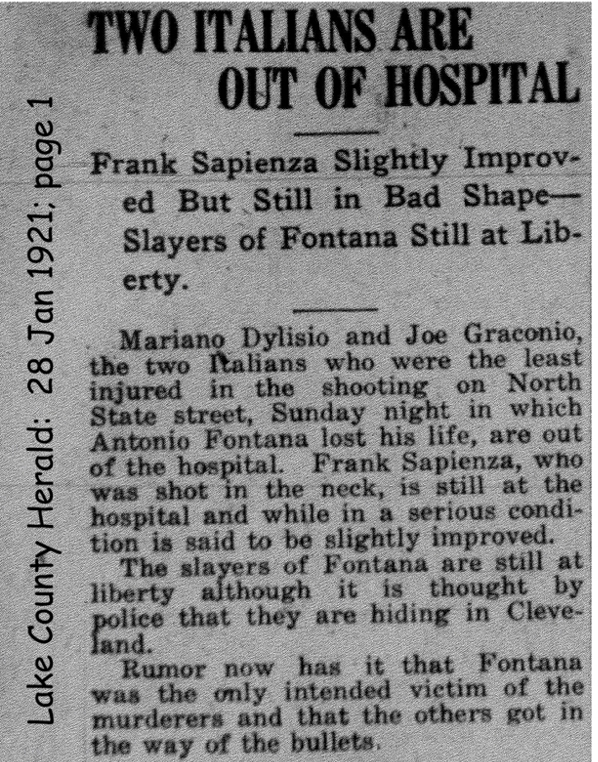 Antonino Fontana first appears at Painesville, Lake County, Ohio, about 1915. Antonino moved his family from Cumberland, Maryland, to Painesville. In America, Antonino Fontana was known Tony Fontana. Antonino Fontana, son of Salvatore Fontana and Santa Caporrino, was born on Friday, June 15, 1883, at Palermo, Sicily. Antonino married Antonina Riccobono, daughter of Francesco Riccobono and Giuseppa Mersino, at Palermo, Sicily. 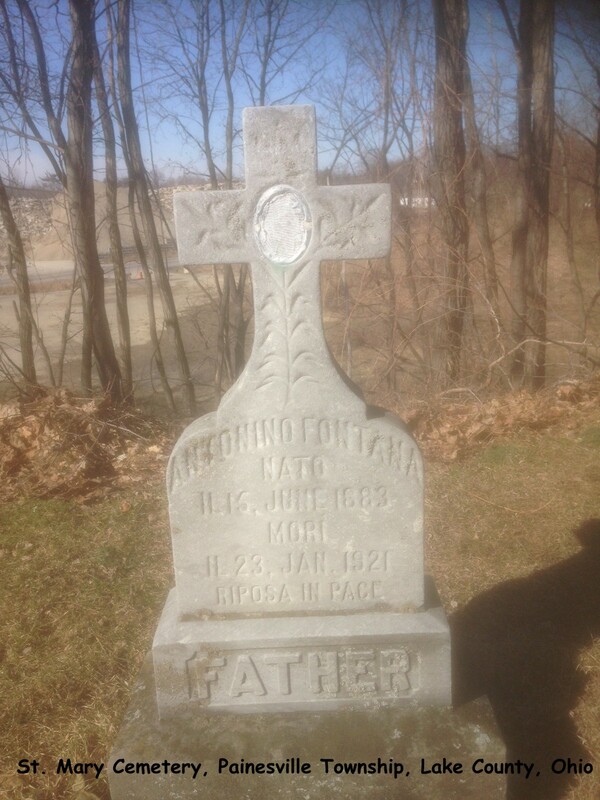 Antonino died on January 24, 1921, at Painesville Hospital, Painesville, Ohio, at age 37. He was the victim of a homicide. His body was interred at St. Mary Cemetery at Painesville Township, Lake County, Ohio. Antonino Fontana first immigrated to the United States on July 6, 1907, at age 24, travelling to Cumberland, Allegheny County, Maryland. Antonino Fontana is cited on a passenger ship manifest re-entering to the United States on June 9, 1909, at age 25, travelling to Reading, Pennsylvania. He was previously in the United States from 1907 until 1909. Antonino Fontana registered for the World War I Draft on September 12, 1918. He was living at 627 State Street, Painesville, Ohio. Antonio was employed by the Diamond Alkali Company. Mr. Fontana was enumerated for the 1920 Census of the United States, on January 6, 1920, living at 108 Railroad Street, Painesville, Ohio. 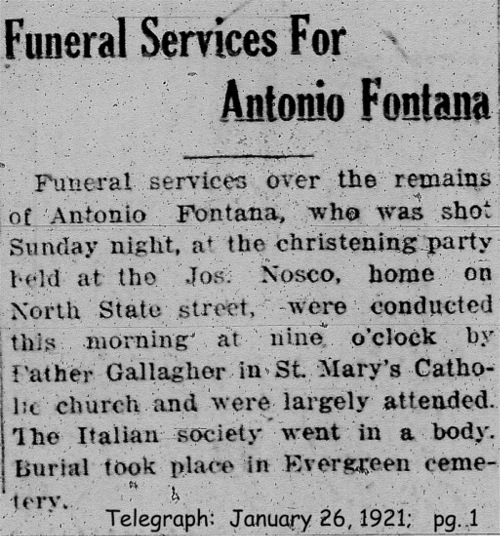 Antonino Fontana’s brother Stefano Fontana was also a Painesville Italian. Painesville Italians Salvatore Caporrino, Giuseppe Caporrino, and brothers, Pietro DiMaggio and Salvatore DiMaggio were probably related to Mr. Fontana’s mother, Santa Caporrino.